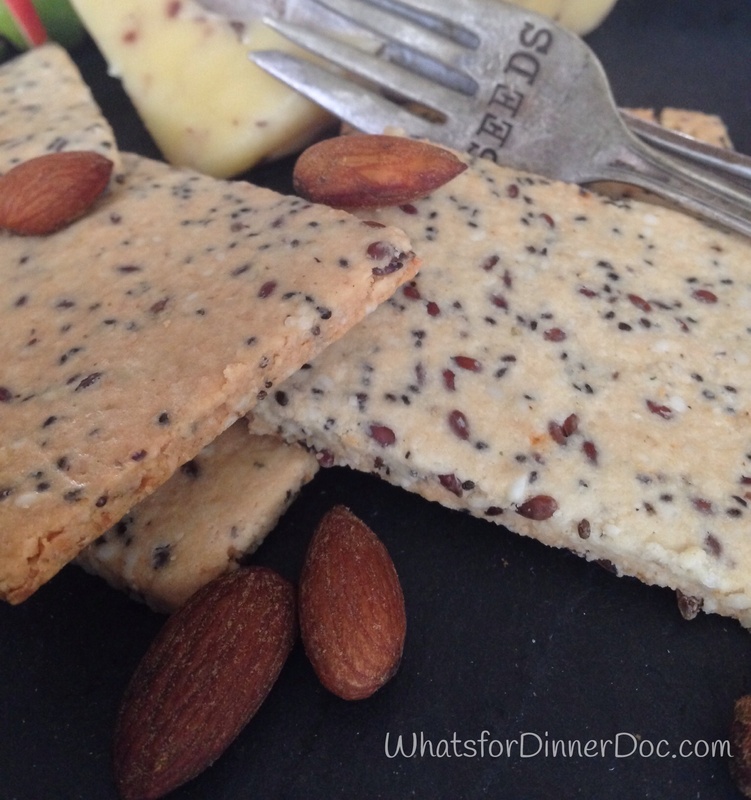 Grain Free Almond, Flax, And Chia Seed Crackers – What's for dinner, Doc? 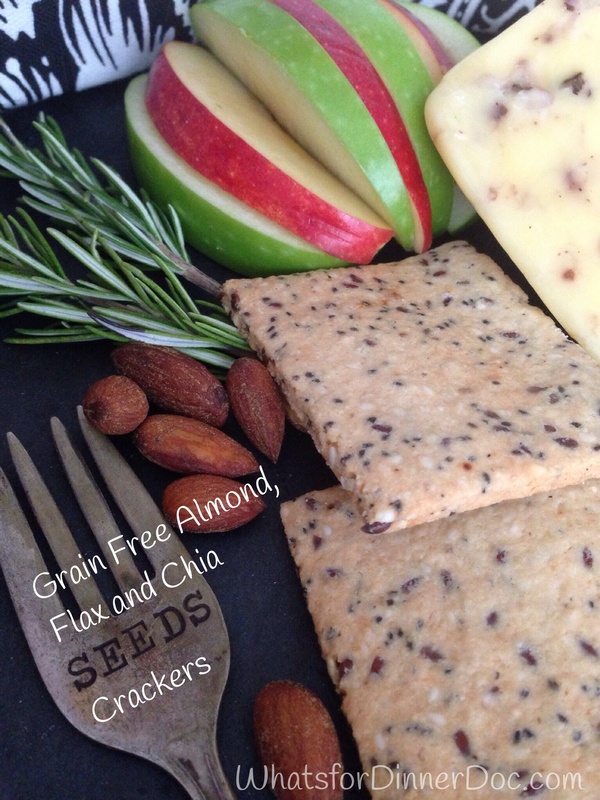 You can make these grain free, gluten free, fiber packed, low carbohydrate and omega 3 rich crackers (now that’s a title) with a food processor, parchment paper and a rolling pin. I threw these together in a few minutes and baked them to crispy goodness in about 15 minutes. Make sure that you roll the sticky dough between parchment paper. The rolling is easy and the clean up is a snap. Follow me over to The Novice Gardener for Fiesta Friday, the best blog party on the Web. You can see an explosion of recipes from all over the globe in one location. Combine eggs, almond flour and spices. Stir in flax, chia and sesame seeds. Combine almond flour, eggs and spices in a food processor until mixed well. Add seeds and pulse 3-4 times to stir in the seeds. The dough will be thick and sticky. Place dough between two pieces of parchment paper cut to the size of your baking sheet. Pat dough into a thick disc and then flatten with a rolling pin to desired thickness. 1/8 inch will give you a substantial cracker for spreading with dips or serving with smoked salmon. Cut dough with a pizza cutter into desired shapes. Slide the dough sheet with the bottom parchment onto your baking sheet. These are delicious and crispy if you roll them paper-thin but adjust the baking time and watch closely so they don’t burn. Bake at 350 F on a baking sheet 13-15 minutes until lightly toasted. You don’t want to burn them because they will be bitter. Break apart when cool. Store in an airtight container. 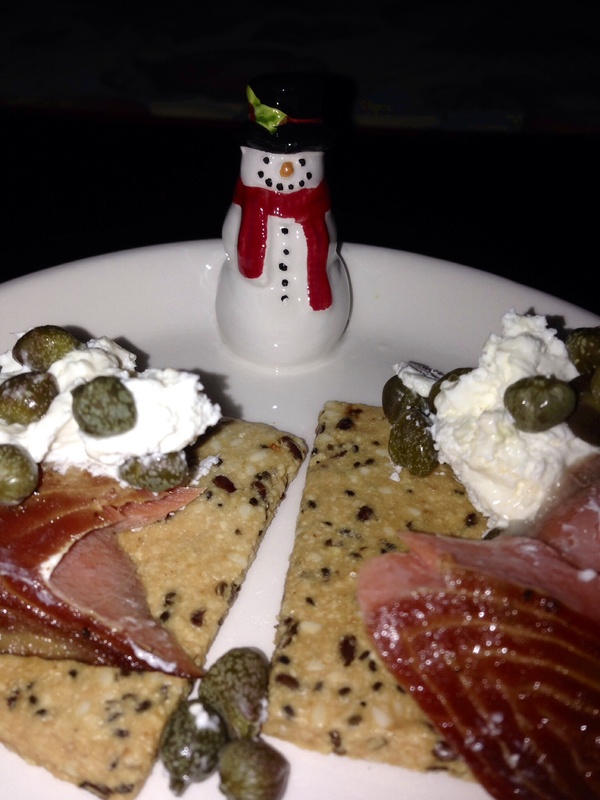 Spread cracker with cream cheese and top with smoked salmon and capers. Serve with sliced apples and cheddar cheese. Take a few in your lunch with salad or soup. Amazon Affiliate Links don’t cost you anything but if you buy anything then I donate all proceeds to the Northern Nevada Food Bank. Thanks Jhuls. I wanted to comment on a post of yours today but I couldn’t figure out how or where to write a comment. Do you have a comment section? Thanks for hosting FF. I knew I was looking for a recipe – just didn’t know what it was for. This is it. Thanks. I was about to make another gluten-free cracker but you’ve just saved me the trouble. Glad to help out Hilda. I’ll see if my favorite geek can have a go at it. Thanks for trying.